Why are there no Stainless Steel Rolex watches Available? Although the second message is similar, there is one big difference. The new Rolex GMT-Master II 126710BLRO is a brand new model that was recently introduced during the Baselworld show. It will take time before these watches land at the dealer. When you are a good customer of a Rolex dealer or have friends in high places, you might be able to source one at retail price. But otherwise, you either need to wait or pay an incredible premium to one of the (grey market) dealers who were able to get one. 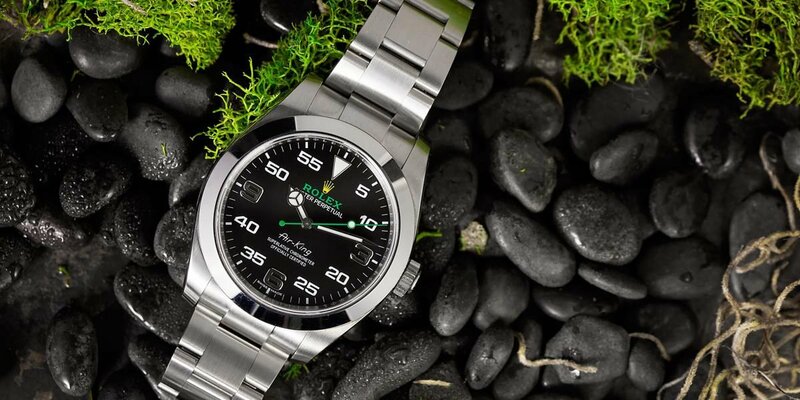 A stainless steel Rolex is almost as common as a BMW 3-series. You can spot them everywhere basically. Submariners are a common sight wherever you go as well. So what happened? Why are these watches all of a sudden so rare? It’s not only the vintage and older models are rare and pricey, any current Submariner, GMT-Master or Daytona model in stainless steel is simply not available at a Rolex dealer. When we asked Rolex about this during our meeting with them in Baselworld, they just acknowledged these watches are in high demand and that they were aware of the availability problem. For the Daytona, this has been the case since the 1990s. The same can always be said of any new model basically. When the Yachtmaster in steel and platinum came out in 1999, it was just not there for a long time. Sometimes, it is just a short period that there is no availability, like the Rolex Milgauss that was re-introduced in 2008. Prices went through the roof for this watch, but today it is a watch you can easily find. With ups and downs, the Rolex Submariner and GMT-Master models were available as well in stainless steel. Full gold or bi-color watches have not really been an issue. When I bought a new Rolex GMT-Master II 16710 in 2006, they were just in the windows everywhere for example. Author adminPosted on July 27, 2018 Categories Rolex WatchesTags Why are there no Stainless Steel Rolex watches Available? The Rolex Yacht-Master wasn’t the most sought-after time piece and list was somewhere around €7000 Euro and pre-owned price far far less. Even under a Rolex Submariner in stainless steel, despite the use of platinum. I know that Rolex purists are not favoring the Yacht-Master, as it is a bit too round, too smooth and too blingy for a sports watch, but I loved it. Still do. The Yacht-Master, introduced in 1992 (the version I had in 1999), actually had a long waiting-list at the start. I am not sure whether the new Rolex Yacht-Master 116621 will have one as well given it is a bi-color (Everose and stainless steel), but let’s have a look at it in detail before I make any assumptions here. The biggest novelty for the Rolex Yacht-Master 116621 is the use of Everose gold in combination with 904L stainless steel. Rolex calls this combination of materials ‘Rolesor’. The uni-directional diving scale bezel is made of Everose gold as well as the solid center links of the Oyster bracelet on this watch. The previous bi-color Rolex Yacht-Master was reference 16623 (introduced in 2005), and had a yellow gold bezel and center links. The first Yacht-Master reference from 1992, 16628, was full gold and had a gold crown as well. For some reason, Rolex chose the bi-color models, including the model I am talking about today, to have a stainless steel crown. Strangely enough, bi-color Datejust, Submariner and GMT-Master models seem to have a gold crown. I suppose there is a reason for the Rolex Yacht-Master 116621 to not to have one, but to me it is unclear why this is the case. The strange thing is that Rolex defines Rolesor as follows: “the name Rolesor was patented by Rolex in 1933 and has become a true Rolex signature. 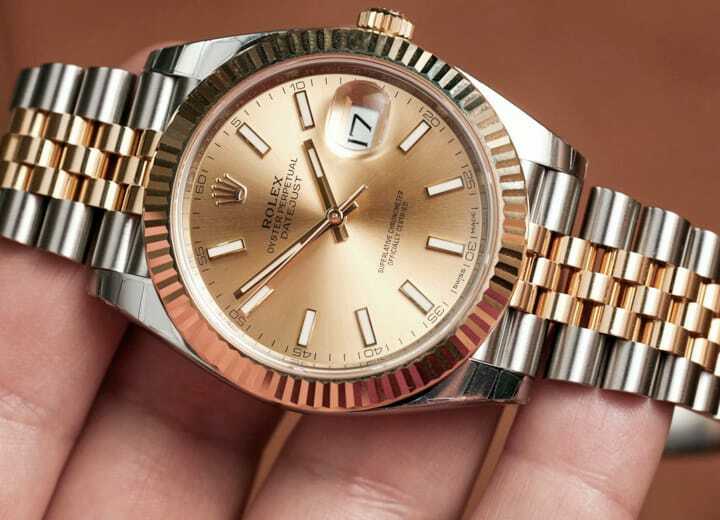 The concept is simple: the bezel, the winding crown and the centre bracelet links are made of 18 ct yellow or Everose gold (Rolex’s exclusive pink gold alloy); the middle case and the outer links of the bracelet are made of 904L stainless steel.”. Rolex clearly calls the new Yacht-Master 116621 to be “Rolesor” as well on their website. Everose is Rolex’ own formula for pink gold. According to Rolex, it is exceptionally durable, polishable (normally, pink gold becomes a bit yellow-ish again after too much polishing) and gives it an everlasting sheen. The Rolex Yacht-Master 116621 does have gold colored hands and ‘Rolex’ printed on the dial in this gold color as well. The contrast with the chocolate colored dial is very easy on the eyes. The Yacht-Master wording remains to be printed in red. The chocolate brown dial has a sun-ray finish which looks awesome in natural light.I always loved the bezel of the Yacht-Master watches, and this Everose bezel with embossed diving scale is just awesome. Like all new Oyster bracelets, it can be resized very easily with the screwed links and adjust it up to 5mm with the Easylink system. The Oyster bracelet remains to be one of the most comfortable bracelets I know, also the most copied one by other brands. Rolex bracelets (Oyster, Jubilee or President) seem to be ‘the reference’ for many people when talking about watch bracelets. Only few other watch brands know how to design and produce well-fitting and easy-to-adjust bracelets. Rolex is King for sure when it comes to bracelets. For now, the Oysterflex bracelet that Rolex showed us last year (click here) has not been shown for this 116621. Perhaps it will become available in the future as an optional bracelet.